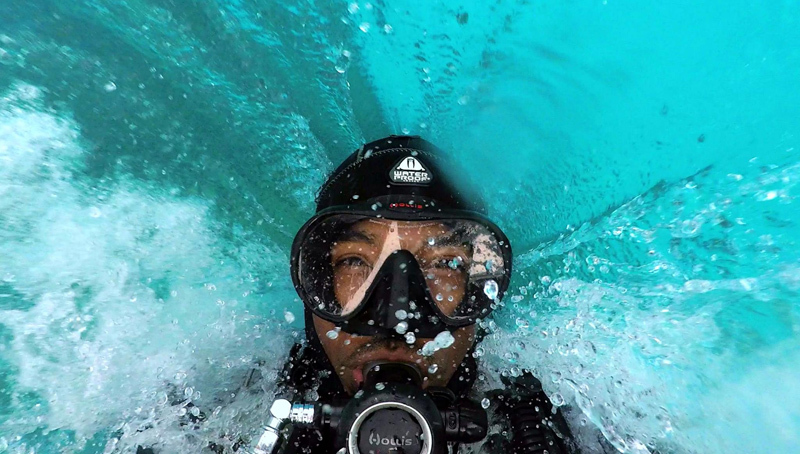 The story says, “Weldon Wade spends most of his time underwater. When he’s not working as a commercial diver off the coast of Bermuda, he’s strapping on his mask and fins and diving to astounding depths as a free diver, holding his breath for three-plus minutes at a time, relying on the air in his lungs for survival. When asked how he got into free diving, and what sets it apart from scuba diving, Mr. Wade said, “My diving journey began about 13 or 14 years ago with scuba diving. It was a bucket list item of mine, so I got certified because I wanted to get more Bermudians into scuba diving. I segued into free diving a couple years after that when I made some friends who were keen to spearfish and hunt lobsters, and you can’t do that scuba diving in Bermuda. I’ve been snorkeling my entire life, and I became a certified free diver in 2014. “Just like the name says, there’s a freedom to free diving. Once you recognize that you can dive down silently and engage with sea life without being noisy, that starts to evolve into a bit of a self-competition in the sense of wanting to stay underwater longer or in some cases go deeper. And that leads most people into training to become a better diver, to have better breath hold, to get to know your body better and to have better in-water experiences with sea life. You can read the full story on the Smithsonian website.